Welcome to Student Leadership and Activities (SLA) at the Bryan Campus! Our SLA office is dedicated to creating a welcoming, inclusive, and collaborative environment for every Blinn student. 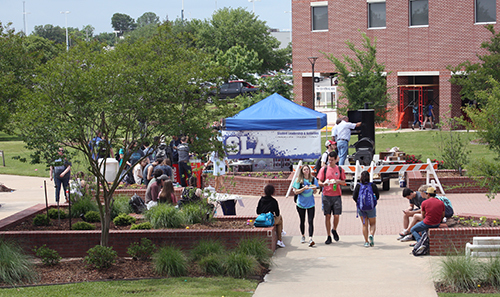 SLA actively seeks new ways to further connect, engage, and inspire our students so they can make the most of their college experience. We oversee all clubs and organizations, the Student Government Association, and all campus-wide activities. Student Leadership and Activities is located in Student Center Room F-104. We strive to ensure the Student Center maintains a vibrant, engaging, and student-oriented atmosphere while serving as the main hub for all activities designed to supplement a student’s curricular experience at Blinn. If you would like to make the most of your time at Blinn, Student Leadership and Activities is the place for you. Monday – Thursday: 8:00 a.m. – 8:30 p.m.